A THROUGH TRAFFIC ROUTE FROM CONNECTICUT TO PENNSYLVANIA: As early as 1949, the New York State Department of Public Works (NYSDPW) proposed an east-west expressway through Putnam, Dutchess, and Orange counties. Part of the state's 1,780-mile "interstate and interregional network," the proposed expressway was to be mostly toll-free, but one section - encompassing the future Newburgh-Beacon Bridge - was to be part of the New York State Thruway system. By 1951, the route of the mainline thruway had been shifted away from the future I-84 south to Rockland County, and the thruway was to cross the Hudson River not at the Newburgh-Beacon Bridge, but at the Tappan Zee Bridge. Three years later, Governor Thomas E. Dewey proposed that the future I-84 be part of a planned network of toll expressways to supplement, and feed traffic into, the mainline New York State Thruway. When President Dwight D. Eisenhower signed the Federal Highway Act into law in 1956, state officials decided to place I-84 on the toll-free Interstate system, taking advantage of the 90 percent Federal funding. Designed to supplement US 6 and other east-west roads between Connecticut and Pennsylvania, I-84 was designed with two-lane carriageways separated by a wide median. The roadways were also separated so as to take advantage of the rolling hills. Furthermore, scenic overlooks and rest areas along the route were designed to provide motorists the opportunity to view the Appalachian foothills. Finally, the proposed I-84 was to include a new crossing - the Newburgh-Beacon Bridge - over the Hudson River, filling a 30-mile gap the Bear Mountain Bridge and the Mid-Hudson Bridge. DESIGN AND CONSTRUCTION OF I-84 IN NEW YORK STATE: While construction on other Interstate routes in New York State was well underway by the late 1950's, work had yet to begin on I-84. In the fall of 1958, during what would be an ultimately successful gubernatorial campaign, Nelson Rockefeller promised swift construction of I-84 through the mid-Hudson region. Originally, I-84 was to be multiplexed with I-87 between the New York State Thruway in Newburgh and Beacon, where a new north-south I-87 freeway was to be constructed south to Elmsford, Westchester County. After plans for this freeway were dropped in 1961, the I-84 / I-87 multiplex was extended east to Brewster, near the New York-Connecticut border. At Brewster, a new alignment was chosen for the I-87 freeway south to White Plains. Construction of the first 16-mile section of I-84 between EXIT 6 (I-87 / New York State Thruway and NY 300 / Union Avenue) in Newburgh and EXIT 13 (US 9) in Fishkill began in 1960. This section consisted of a four-lane, dual-carriageway roadbed, except for the two-lane undivided Newburgh-Beacon Bridge. 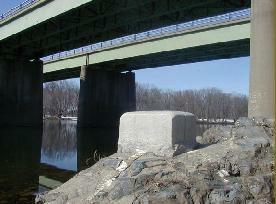 Both the bridge and the initial section of I-84 were opened to traffic on November 2, 1963. The four-lane expressway was extended six and one-half miles to EXIT 16 (Taconic State Parkway) in 1964. On July 1, 1971, the four-lane I-84 was completed west from Newburgh to the Delaware River, providing a limited-access route from Connecticut to Pennsylvania. As traffic increased on I-84 (and the route was extended west to Scranton), chronic backups on either side of the two-lane Newburgh-Beacon Bridge soon appeared, prompting Federal and state officials to approve final construction of a parallel Newburgh-Beacon span in 1975. The new parallel span, which opened on November 1, 1980, provided four traffic lanes, two in each direction. In 1984, after four years of rehabilitation on the original span, the two bridges were reconfigured to allow for three traffic lanes in each direction. ONCE PART OF THE THRUWAY SYSTEM, BUT NO LONGER: To maintain a steady source of maintenance revenue during the financial crisis of the early 1990s, the New York State Department of Transportation (NYSDOT) handed maintenance responsibilities of I-84 and the Cross Westchester Expressway (I-287) over to the New York State Thruway Authority (NYSTA) in October 1991. New NYSTA reference markers were posted every one-tenth mile along the route, but the NYSDOT maintained responsibility for large-scale capital projects. On October 30, 2006, the NYSTA returned maintenance duties to the NYSDOT. In 1999, the NYSDOT and NYSTA completed a $25 million reconstruction of EXIT 13 (US 9) in Fishkill. The project involved building two new bridges over a widened US 9, constructing new exit and entrance ramps, and widening and repaving three miles of I-84. Other improvements included the installation of new drainage, guide rails, fencing, signs, traffic signals, box culverts, and landscaping. The NYSDOT rehabilitated the pavement along I-84 through the length of Putnam County, from EXIT 17 (Putnam CR 43) to the New York-Connecticut border. 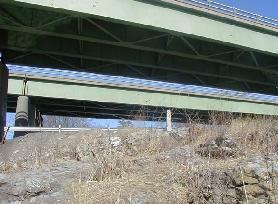 As part of the project, the NYSDOT is replacing the Dingle Hill Road overpass just west of the New York-Connecticut border. The four-year, $17 million project was completed in 2007. 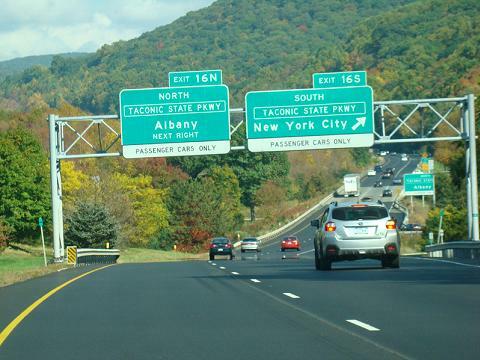 In 2002, the Federal Highway Administration (FHWA) approved previously announced plans to construct a $100 million direct interchange connection between I-84 and the New York State Thruway (I-87) in Newburgh. At the present time, approximately 35,000 vehicles per day (AADT) use NY 300 (Union Avenue) to travel between the two interstate highways. Under the proposal, access to NY 300 from I-84 remains at the existing EXIT 7N location, with modified ramps and new intersections built at the ramp terminals. Access to NY 300 from the Thruway (EXIT 17) is from new ramps that meet NY 300 at the intersection across from the I-84 eastbound ramp (EXIT 7A). The existing ramp system to access NY 300 was removed, while the existing ramps adjacent to the Thruway remain. Work on the project began in August 2003 and was completed in December 2009. The NYSDOT completed the $50 million "Stewart Airport Access Connection," a new four-lane divided highway connecting I-84 to the Stewart Airport passenger terminal, in November 2007. The new 2.5-mile-long highway, which was given the NY 747 designation, was built roughly along the alignment of Drury Lane (Orange CR 54), and entailed construction of a new diamond interchange on I-84 at EXIT 5A. In 1995, the speed limit on I-84 from the Delaware River (New York-Pennsylvania border) east to EXIT 7 (I-87 / NY 300) in Newburgh was increased to 65 MPH. The NYSDOT raised the speed limit to 65 MPH from EXIT 12 (NY 52) in Fishkill to EXIT 20 (I-684) in Brewster in 2009. DOES I-84 ENTER NEW JERSEY? One of the more interesting features of I-84 in New York State appears in Port Jervis, where the boundaries of New York, New Jersey and Pennsylvania converge. Here, an exit ramp at EXIT 1 (US 6-NY 97-NJ 23) ends some 100 yards north of the New York-New Jersey border. The interchange itself is located one-half mile east of the New York-Pennsylvania border. AT LEAST SIX LANES FROM NEWBURGH TO HARTFORD: I-84 should be expanded to six lanes, and to eight lanes at selected locations, between Stewart Airport and Hartford. Interchange improvements, including the elimination of left-hand entrances and exits, should be made wherever possible. Shoulders should be built on bridges that do not have them. SOURCES: "Freeways Are Now Urged," The New York Times (12/13/1936); Highway Needs in New York State, New York State Department of Public Works (1949); "Rockefeller Pledges Support for Highway," The New York Times (10/30/1958); Regional Highways: Status Report, Tri-State Transportation Commission (1962); "Ceremony Opens Newburgh Span" by Bernard Stengren, The New York Times (11/03/1963); "I-84 Route Complete Through New York State," The New York Times (7/02/1971); "A New Bridge Is Added to an Old One Between Two Hudson Cities," The New York Times (11/01/1980); "Governor Announces I-84 / I-87 Direct Connection in Orange County," New York State Thruway Authority (5/05/1999); "I-84, Thruway Connector Gets Federal Funding" by John Milgram, The Times-Herald Record (3/02/2002); "Drury Lane Airport Interchange Project Is Right on Schedule" by Judy Rife, The Times-Herald Record (2/11/2007); "Speed Limit Raised on Part of I-84 to 65 MPH" by Terence Corcoran, The Journal News (3/02/2009); Berger, Lehman Associates; New York State Department of Transportation; Urbitran Group; Jay Hogan; Mike Moroney; Scott Oglesby; William Welner. I-84 and New York State Thruway shields by Ralph Herman. I-84 (New York) exit list by Steve Anderson.